The effects of the division of labour, in the general business of society, will be more easily understood, by considering in what manner it operates in some particular manufactures. It is commonly supposed to be carried furthest in some very trifling ones; not perhaps that it really is carried further in them than in others of more importance: but in those trifling manufactures which are destined to supply the small wants of but a small number of people, the whole number of workmen must necessarily be small; and those employed in every different branch of the work can often be collected into the same workhouse, and placed at once under the view of the spectator. To take an example, therefore, from a very trifling manufacture; but one in which the division of labour has been very often taken notice of, the trade of the pin-maker; a workman not educated to this business (which the division of labour has rendered a distinct trade), nor acquainted with the use of the machinery employed in it (to the invention of which the same division of labour has probably given occasion), could scarce, perhaps, with his utmost industry, make one pin in a day, and certainly could not make twenty. But in the way in which this business is now carried on, not only the whole work is a peculiar trade, but it is divided into a number of branches, of which the greater part are likewise peculiar trades. One man draws out the wire, another straights it, a third cuts it, a fourth points it, a fifth grinds it at the top for receiving the head; to make the head requires two or three distinct operations; to put it on, is a peculiar business, to whiten the pins is another; it is even a trade by itself to put them into the paper; and the important business of making a pin is, in this manner, divided into about eighteen distinct operations, which, in some manufactories, are all performed by distinct hands, though in others the same man will sometimes perform two or three of them. I have seen a small manufactory of this kind where ten men only were employed, and where some of them consequently performed two or three distinct operations. But though they were very poor, and therefore but indifferently accommodated with the necessary machinery, they could, when they exerted themselves, make among them about twelve pounds of pins in a day. There are in a pound upwards of four thousand pins of a middling size. Those ten persons, therefore, could make among them upwards of forty-eight thousand pins in a day. Each person, therefore, making a tenth part of forty-eight thousand pins, might be considered as making four thousand eight hundred pins in a day. But if they had all wrought separately and independently, and without any of them having been educated to this peculiar business, they certainly could not each of them have made twenty, perhaps not one pin in a day; that is certainly, not the two hundred and fortieth, perhaps not the four thousand eight hundredth part of what they are at present capable of performing, in consequence of a proper division and combination of their different operations. In every other art and manufacture, the effects of the division of labour are similar to what they are in this very trifling one; though, in many of them, the labour can neither be so much subdivided, nor reduced to so great a simplicity of operation. The division of labour, however, so far as it can be introduced, occasions, in every art, a proportionate increase of the productive powers of labour. The separation of different trades and employments from one another, seems to have taken place, in consequence of this advantage. This separation too is generally carried furthest in those countries which enjoy the highest degree of industry and improvement; what is the work of one man in a rude state of society, being generally that of several in an improved one. In every improved society, the farmer is generally nothing but a farmer; the manufacturer, nothing but a manufacturer. The labour too which is necessary to produce any one complete manufacture, is almost always divided among a great number of hands. How many different trades are employed in each branch of the linen and woollen manufacturers, from the growers of the flax and the wool, to the bleachers and smoothers of the linen, or to the dyers and dressers of the cloth! The nature of agriculture, indeed, does not admit of so many subdivisions of labour, nor of so complete a separation of one business from another, as manufactures. It is impossible to separate so entirely, the business of the grazier from that of the corn-farmer, as the trade of carpenter is commonly separated from that of the smith. The spinner is almost always a distinct person from the weaver; but the ploughman, the harrower, the sower of the seed, and the reaper of the corn, are often the same. The occasions for those different sorts of labour returning with the different seasons of the year, it is impossible that one man should be constantly employed in any one of them. This impossibility of making so complete and entire a separation of all the different branches of labour employed in agriculture, is perhaps the reason why the improvement of the productive powers of labour in this art, does not always keep pace with their improvement in manufactures. The most opulent nations, indeed, generally excel all their neighbours in agriculture as well as in manufacturers; but they are commonly more distinguished by their superiority in the latter than in the former. Their lands are in general better cultivated, and having more labour and expence bestowed upon them, produce more in proportion to the extent and natural fertility of the ground. But this superiority of produce is seldom much more than in proportion to the superiority labour and expence. In agriculture, the labour of the rich country is not always much more productive than that of the poor; or, at least, it is never so much more productive, as it commonly is in manufactures. The corn of the rich country, therefore, will not always, in the same degree of goodness, come cheaper to market than that of the poor. The corn of Poland, in the same degree of goodness, is as cheap as that of France, notwithstanding the superior opulence and improvement of the latter country. The corn of France is, in the corn provinces, fully as good, and in most years nearly about the same price with the corn of England, though, in opulence and improvement, France is perhaps inferior to England. The corn-lands of England, however, are better cultivated than those of France, and the corn-lands of France are said to be much better cultivated than those of Poland. But though the poor country, notwithstanding the inferiority of its cultivation, can, in some measure, rival the rich in the cheapness and goodness of its corn, it can pretend to no such competition in its manufactures; at least if those manufactures suit the soil, climate, and situation of the rich country. The silks of France are better and cheaper than those of England, because the silk manufacture, at least under the present high duties upon the importation of raw silk, does not so well suit the climate of England as that of France. But the hard-ware and the coarse woollens of England are beyond all comparison superior to those of France, and much cheaper too in the same degree of goodness. In Poland there are said to be scarce any manufactures of any kind, a few of those coarser household manufactures excepted, without which no country can well subsist. 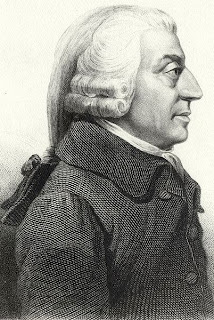 First, the improvement of the dexterity of the workman necessary increases the quantity of the work he can perform; and the division of labour, by reducing every man’s business to some one simple operation, and by making this operation the sole employment of his life, necessarily increases very much the dexterity of the workman. A common smith, who, though accustomed to handle the hammer, has never been used to make nails, if upon some particular occasion he is obliged to attempt it, will scarce, I am assured, be able to make above two or three hundred nails in a day, and those too very bad ones. A smith who has been accustomed to make nails, but whose sole or principal business has not been that of a nailer, can seldom with his utmost diligence make more than eight hundred or a thousand nails in a day. I have seen several boys under twenty years of age who had never exercised any other trade but that of making nails, and who, when they exerted themselves, could make, each of them, upwards of two thousand three hundred nails in a day. The making of a nail, however, is by no means one of the simplest operations. The same person blows the bellows, stirs or mends the fire as there is occasion, heats the iron, and forges every part of the nail: In forging the head too he is obliged to change his tools. The different operations into which the making of a pin, or of a metal button, is subdivided, are all of them much more simple, and the dexterity of the person, of whose life it has been the sole business to perform them, is usually much greater. The rapidity with which some of the operations of those manufactures are performed, exceeds what the human hand could, by those who had never seen them, be supposed capable of acquiring. Secondly, the advantage which is gained by saving the time commonly lost in passing from one sort of work to another, is much greater than we should at first view be apt to imagine it. It is impossible to pass very quickly from one kind of work to another, that is carried on in a different place, and with quite different tools. A country weaver, who cultivates a small farm, must lose a good deal of time in passing from his loom to the field, and from the field to his loom. When the two trades can be carried on in the same workhouse, the loss of time is no doubt much less. It is even in this case, however, very considerable. A man commonly saunters a little in turning his hand from one sort of employment to another. When he first begins the new work he is seldom very keen and hearty; his mind, as they say, does not go to it, and for some time he rather trifles than applies to good purpose. The habit of sauntering and of indolent careless application, which is naturally, or rather necessarily acquired by every country workman who is obliged to change his work and his tools every half hour, and to apply his hand in twenty different ways almost every day of his life; renders him almost always slothful and lazy, and incapable of any vigorous application even on the most pressing occasions. Independent, therefore, of his deficiency in point of dexterity, this cause alone must always reduce considerably the quantity of work which he is capable of performing. Thirdly, and lastly, every body must be sensible how much labour is facilitated and abridged by the application of proper machinery. It is unnecessary to give any example. I shall only observe, therefore, that the invention of all those machines by which labour is so much facilitated and abridged, seems to have been originally owing to the division of labour. Men are much more likely to discover easier and readier methods of attaining any object, when the whole attention of their minds is directed towards that single object, than when it is dissipated among a great variety of things. But in consequence of the division of labour, the whole of every man’s attention comes naturally to be directed towards some one very simple object. It is naturally to be expected, therefore, that some one or other of those who are employed in each particular branch of labour should soon find out easier and readier methods of performing their own particular work, wherever the nature of it admits of such improvement. A great part of the machines made use of in those manufactures in which labour is most subdivided, were originally the inventions of common workmen, who, being each of them employed in some very simple operation, naturally turned their thoughts towards finding out easier and readier methods of performing it. Whoever has been much accustomed to visit such manufacturers, must frequently have been shewn very pretty machines, which were the inventions of such workmen, in order to facilitate and quicken their own particular part of the work. In the first fire-engines, a boy was constantly employed to open and shut alternately the communication between the boiler and the cylinder, according as the piston either ascended or descended. One of those boys, who loved to play with his companions, observed that, by tying a string from the handle of the valve which opened this communication to another part of the machine, the valve would open and shut without his assistance, and leave him at liberty to divert himself with his play-fellows. One of the greatest improvements that has been made upon this machine, since it was first invented, was in this manner the discovery of a boy who wanted to save his own labour. All the improvements in machinery, however, have by no means been the inventions of those who had occasion to use the machines. Many improvements have been made by the ingenuity of the makers of the machines, when to make them became the business of a peculiar trade; and some by that of those who are called philosophers or men of speculation, whose trade it is not to do any thing, but to observe every thing; and who, upon that account, are often capable of combining together the powers of the most distant and dissimilar objects. In the progress of society, philosophy or speculation becomes, like every other employment, the principal or sole trade and occupation of a particular class of citizens. Like every other employment too, it is subdivided into a great number of different branches, each of which affords occupation to a peculiar tribe or class of philosophers; and this subdivision of employment in philosophy, as well as in every other business, improves dexterity, and saves time. Each individual becomes more expert in his own peculiar branch, more work is done upon the whole, and the quantity of science is considerably increased by it. It is the great multiplication of the productions of all the different arts, in consequence of the division of labour, which occasions, in a well-governed society, that universal opulence which extends itself to the lowest ranks of the people. Every workman has a great quantity of his own work to dispose of beyond what he himself has occasion; and every other workman being exactly in the same situation, he is enabled to exchange a great quantity of his own goods for a great quantity, or, what comes to the same thing, for the price of a great quantity of theirs. He supplies them abundantly with what they have occasion for, and they accommodate him as amply with what he has occasion for, and a general plenty diffuses itself through all the different ranks of the society. Observe the accommodation of the most common artificer or day-labourer in a civilized and thriving country, and you will perceive that the number of people of whose industry a part, though but a small part, has been employed in procuring him this accommodation, exceeds all computation. The woollen coat, for example, which covers the day-labourer, as coarse and rough as it may appear, is the produce of the joint labour of a great multitude of workmen. The shepherd, the sorter of the wool, the wool-comber or carder, the dyer, the scribbler, the spinner, the weaver, the fuller, the dresser, with many others, must all join their different arts in order to complete even this homely production. How many merchants and carriers, besides, must have been employed in transporting the materials from some of those workmen to others who often live in a very distant part of the country! how much commerce and navigation in particular, how many ship-builders, sailors, sail-makers, rope-makers, must have been employed in order to bring together the different drugs made use of by the dyer, which often come from the remotest corners of the world! What a variety of labour too is necessary in order to produce the tools of the meanest of those workmen! To say nothing of such complicated machines as the ship of the sailor, the mill of the fuller, or even the loom of the weaver, let us consider only what a variety of labour is requisite in order to form that very simple machine, the shears with which the shepherd clips the wool. The miner, the builder of the furnace for smelting the ore, the feller of the timber, the burner of the charcoal to be made use of in the smelting-house, the brick-maker, the brick-layer, the workmen who attend the furnace, the mill-wright, the forger, the smith, must all of them join their different arts in order to produce them. Were we to examine, in the same manner, all the different parts of his dress and household furniture, the coarse linen shirt which he wears next his skin, the shoes which cover his feet, the bed which he lies on, and all the different parts which compose it, the kitchen-grate at which he prepares his victuals, the coals which he makes use of for that purpose, dug from the bowels of the earth, and brought to him perhaps by a long sea and a long land carriage, all the other utensils of his kitchen, all the furniture of his table, the knives and forks, the earthen or pewter plates upon which he serves up and divides his victuals, the different hands employed in preparing his bread and his beer, the glass window which lets in the heat and the light, and keeps out the wind and the rain, with all the knowledge and art requisite for preparing that beautiful and happy invention, without which these northern parts of the world could scarce have afforded a very comfortable habitation, together with the tools of all the different workmen employed in producing those different conveniences; if we examine, I say, all these things, and consider what a variety of labour is employed about each of them, we shall be sensible that without the assistance and co-operation of many thousands, the very meanest person in a civilized country could not be provided, even according to, what we very falsely imagine, the easy and simple manner in which he is commonly accommodated. Compared, indeed, with the more extravagant luxury of the great, his accommodation must not doubt appear extremely simple and easy; and yet it may be true, perhaps, that the accommodation of an European prince does no always so much exceed that of an industrious and frugal peasant, as the accommodation of the latter exceeds that of many an African king, the absolute master of the lives and liberties of ten thousand naked savages.